All the tags are nicely tucked up at home in their pockets. I will share some more TAGS next month thanks for popping by and I truly love reading the words you leave for me bye for now until next time we meet . Gorgeous tags Heather! Love the sentiments (assuming stamps)! Fabulous! Wowwwwwwwwwwww! These are gorgeous! I love love love the colors!!!! Marvelous beauty in black and white. Love it. They are so gorgeous and elegant! Truly amazing tags! Kraft is so gorgeous in your hands! Your tags are beautiful as well as being inspirational! Have a happy day! The tags are gorgeous...but the sayings are what really pulls me in! I love that you find such fabulous quotes:):) And I'm like you - I have a few places around the house that I display my pages etc & it's really fun to choose different ones each week or so!!! Wonderful tags, Heather! I love tags too and I always go back to making them. I love quotes too and I love seeing how you used them on the tags. What a great idea to change the tags weekly so you can see all of them. 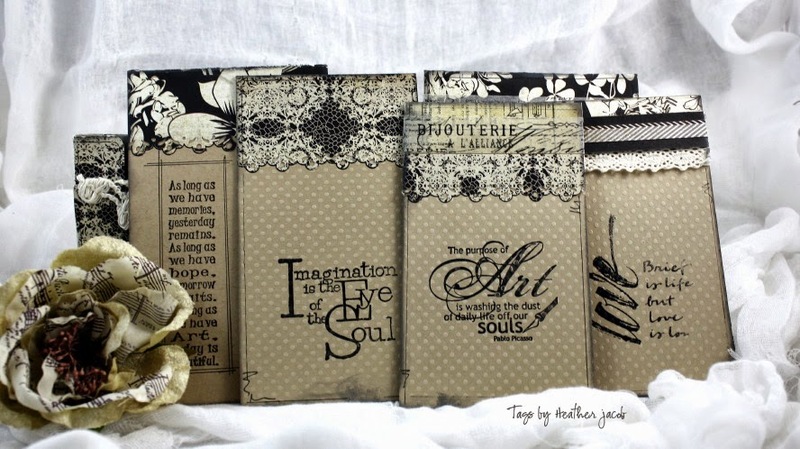 These are super, gorgeous tags Heather and the sentiments so special! Love them all, and love the beautiful colouring!